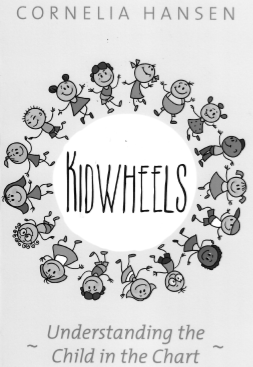 KIDWHEELS Understanding the Child in your Chart, Cornelia Hansen. The Wessex Astrologer, PO Box 9307, Swanage, Dorset BH19 9BF, England. www.wessexastrologer.com. Trade Paper. 114 Pages. £11.00, $17.60. So merging the ancient system of astrology with modern psychology seems a natural fit. It has good and bad points. In this work the author applies astrological insights to child psychology. Basically she is translating the language of the Horoscope into the prevailing psychological language. Many parents wonder how their children can be so different each from the other. I get this all the time in my practice. “After all” they say “they have the same genes, the same DNA, the same parents, the same basic upbringing”. How can this be? The Horoscope is the answer. Each has a different Horoscope and thus a different nature and different destiny. Each has to be handled differently based on this. A book like this is perfect for such people, especially if they are students of either astrology or psychology. of response, persistence, distractability and many more categories. She even has worksheets where an astrologer (even a beginner) can take a child’s chart and determine the child’s temperament. Then she gives strategies for dealing with each type.